U.S. equity index futures were higher this morning. S&P 500 futures were up 9 points in pre-opening trade. Index futures were virtually unchanged following release of the ADP report at 8:15 AM EDT Consensus for January ADP Employment was a drop to 175,000 from 271,000 in November. Actual was 213,000. Apple gained $8.17 to $162.85 after offering guidance on new products. 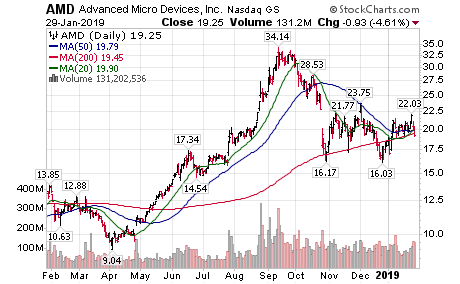 Advanced Micro Devices added $1.94 to $21.19 after releasing positive guidance. 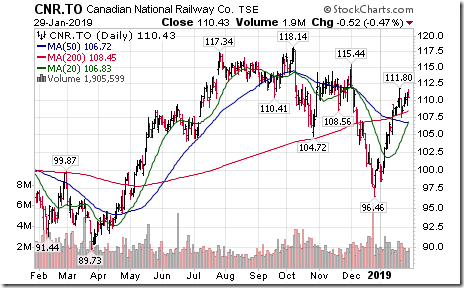 Canadian National Railway (CNI CNR.TO) is expected to open higher after announcing an 18% increase in its dividend. 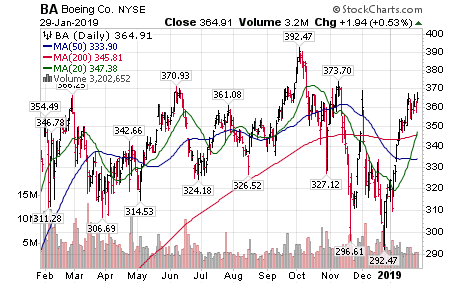 Boeing jumped $22.10 to 387.01 after reporting higher than consensus fourth quarter sales and earnings. The company also raised guidance. 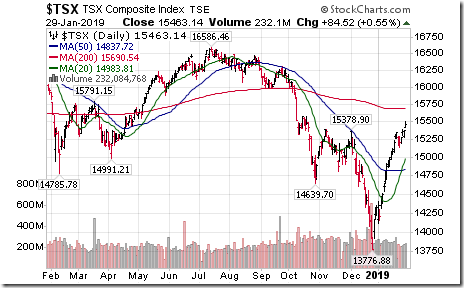 TSX Composite Index moved above 15,393.05 extending an intermediate uptrend. 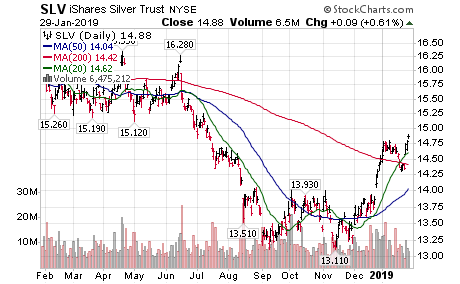 Silver ETN SLV moved above $14.80 extending an intermediate uptrend. 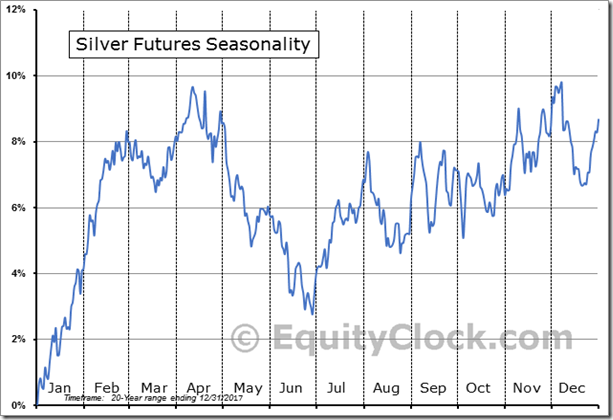 ‘Tis the season for silver SLV to move higher to April! 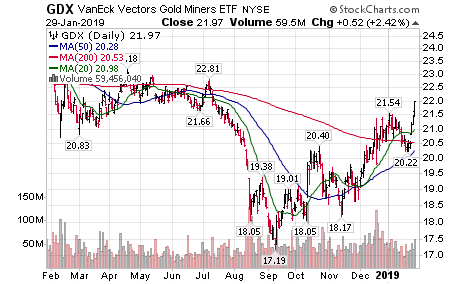 Gold Equity ETFs GDX and GDXJ moved above $21.54 and $31.58 respectively extending an intermediate uptrend. 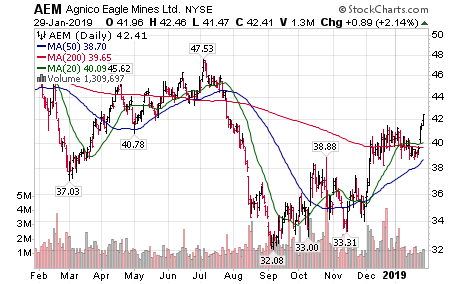 Agnico-Eagle AEM moved above $41.53 U.S. extending an intermediate uptrend. 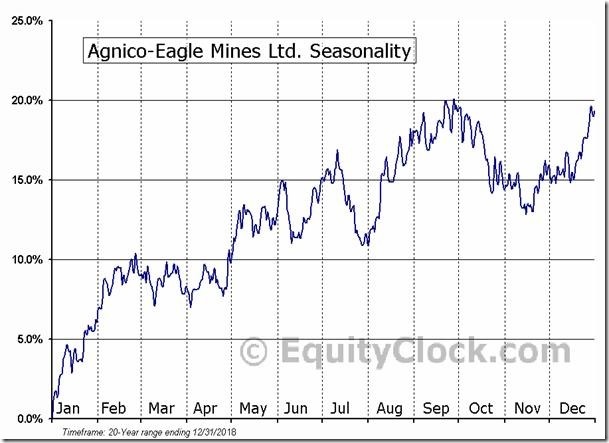 ‘Tis the season for Agnico-Eagle AEM, gold stocks and gold equity ETFs to move higher to the end of February! 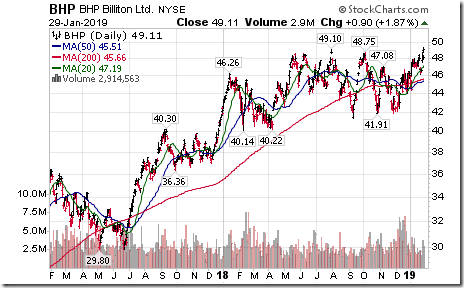 BHP Billiton BHP moved above $48.75 and $49.10 to a three year high extending an intermediate uptrend. 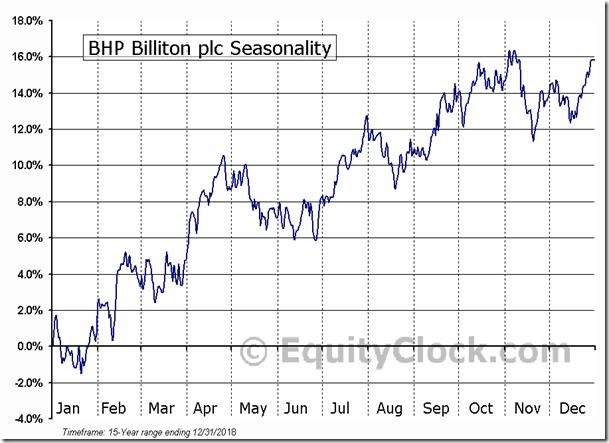 ‘Tis the season for BHP Billiton and base metal stocks to move higher to the end of April! 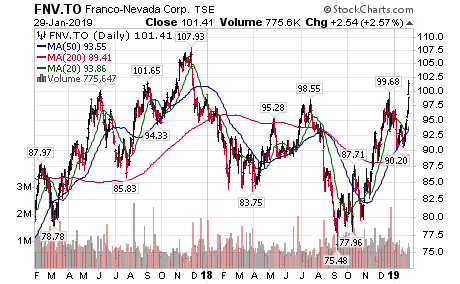 Franco-Nevada FNV.TO moved above $99.68 Cdn extending an intermediate uptrend. 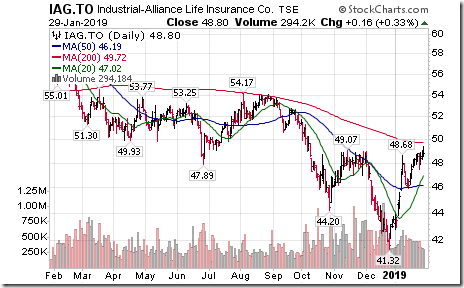 Industrial Alliance IAG.TO moved above $48.68 and $49.07 completing a reverse Head & Shoulders pattern. 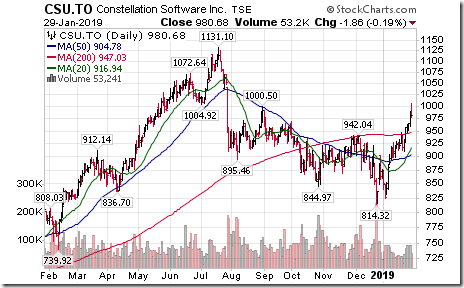 Constellation Software CSU.TO, a TSX 60 stock moved above $1000.50 extending an intermediate uptrend. 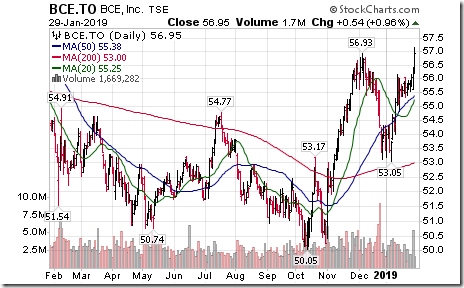 BCE BCE.TO, a TSX 60 stock moved above $56.93 extending an intermediate uptrend. 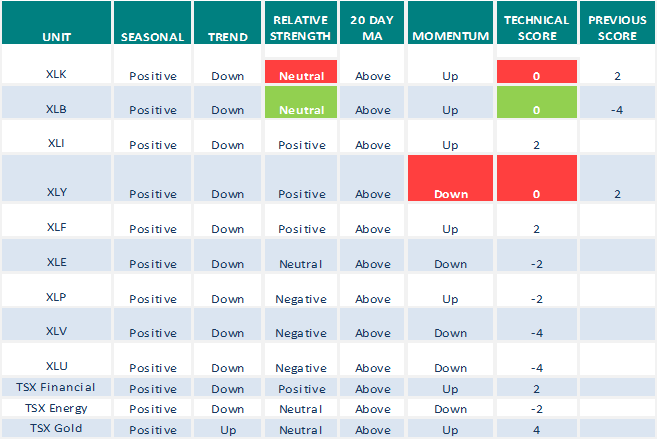 Technical action by S&P 500 stocks yesterday: Bullish. 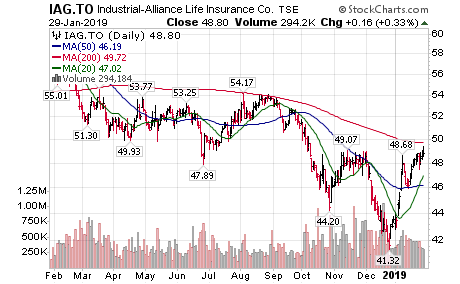 Intermediate breakouts: LLL, HRS, AVY, ALB, WHR, MAA, TDG, ARE, EQR and OMC. Breakdown: ABBV. 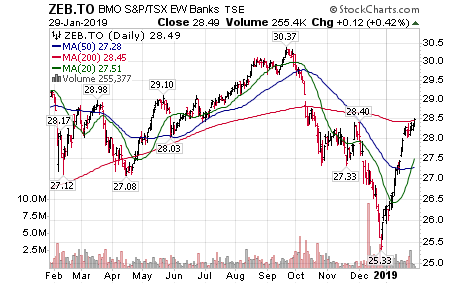 The Barometer added 2.80 to 73.00 yesterday. 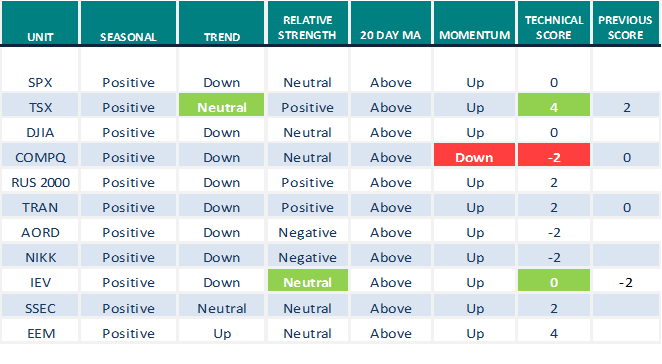 It remains intermediate overbought, but continues to trend higher. 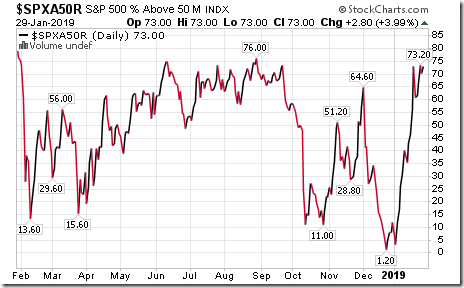 The Barometer added 0.42 to 79.75 yesterday. 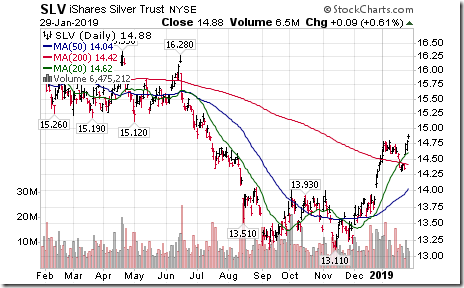 It remains intermediate overbought, but continues to trend higher. Thank you for the cautionary statements on OIH. I’d rather stay away from it after looking at your well crafted charts. 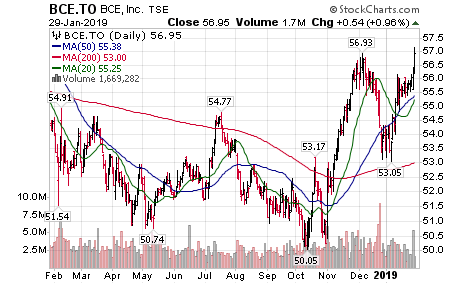 Do you think BCE.TO has strong resistance at 57.50 area ? 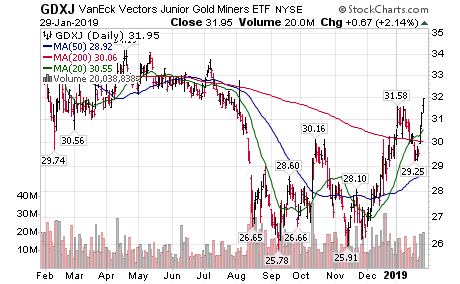 or do you see it nicely running up to the $58.90 area ? 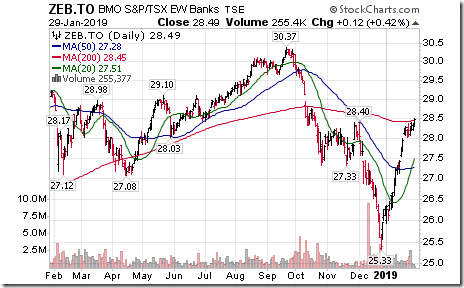 BCE.to sold off like most stocks on high volume in Dec but has bounced back strongly. 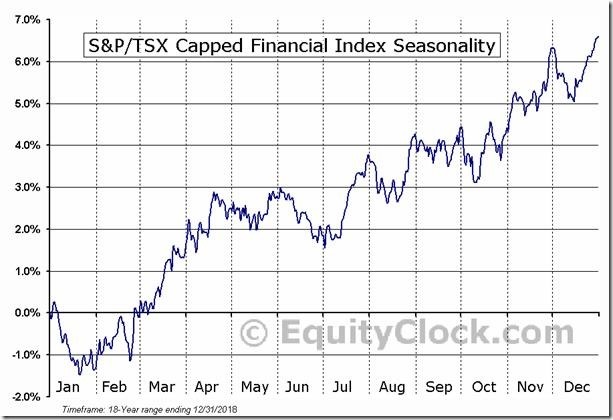 It’s now less than 2 bucks away from the late 2017 high so I wouldn’t be chasing the last buck or two. 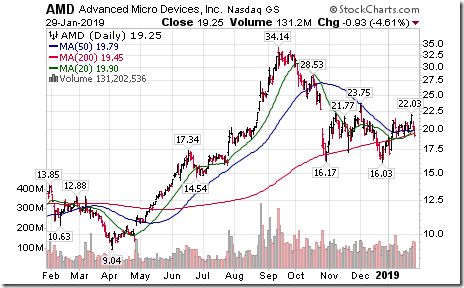 It has been outperforming T.to and FTS.to for the last couple of months and the 20ema is above the 50ema which is above the 200ema so the stock is healthy but also overbought short term from the quick run up. 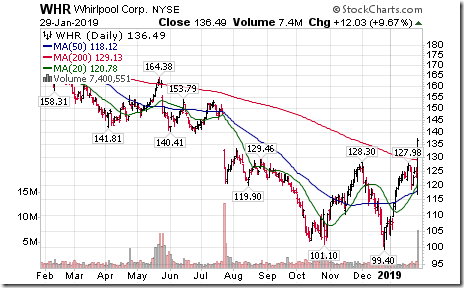 It is a volatile stock with big moves up and down as well. It does have respect for $50 and buying might be best on a pullback to its uptrendline that it’s likely to test. This is not a stock for a quiet ride. 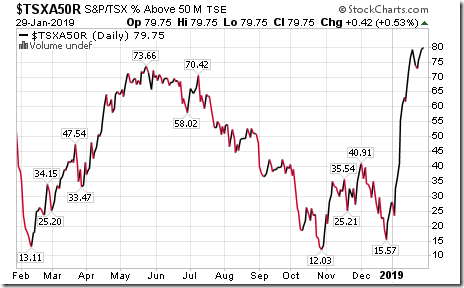 Here is the Equity Clock Seasonality chart & data for TECK/B.to. The best buy date is November 20th with a sell date of February 14th. 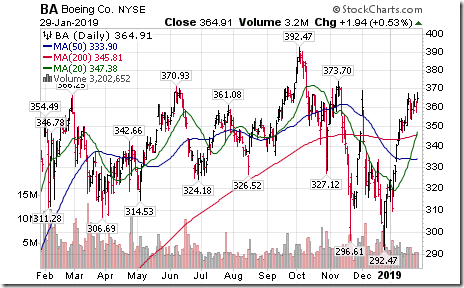 BCE on the NYSE is a better choice to watch technically due to the fluctuations of the CD$. 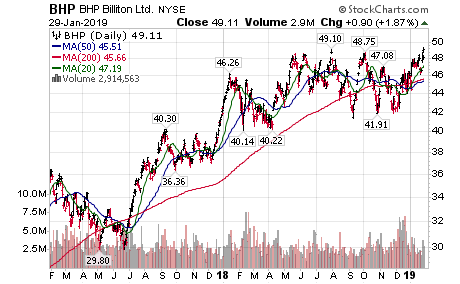 See this chart of BCE at a double top of $43 which is also the FIB61.8% retracment level of the late 2017 high to the Nov/18 low. That is major price resistance with little price change on the way up to next resistance at just $1.50 higher. So depite the strong techncials it’s not worth the gamble to chase it here regardless of what it does. 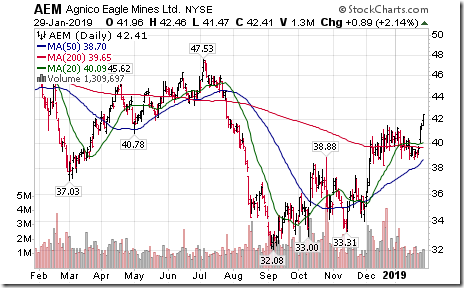 I thought TECK was a base metal stock like BHP, so why the difference in timing? does anyone remember what figure Armstrong was using for month-end?…was it 25003?. Please check Jan.10th report. That is the report I needed help understanding. 25005 and further down the report 25000 was mentioned. FWIW the market is on steroids thanks partly to the FED. 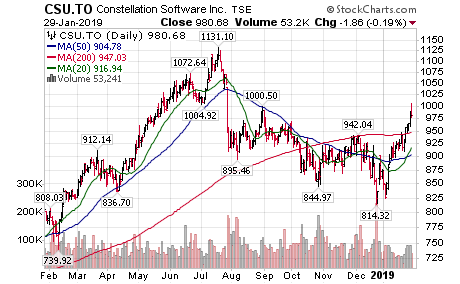 today 20SMA cross above 50SMA = bullish !!! 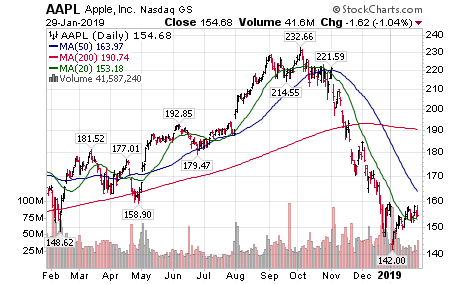 Hopefully soon SPX and the other indexes will cross above 200 SMA too and stay there long enough for the other 20SMA and 50SMA to cross above 200 SMA too. 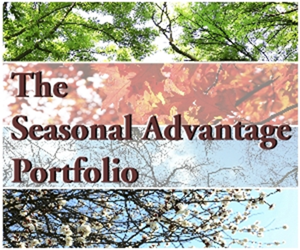 what FED will do this year ? but this probability can change all the time based of future informations : inflation , economic data , unemployment ( first Friday in every the month ) etc . 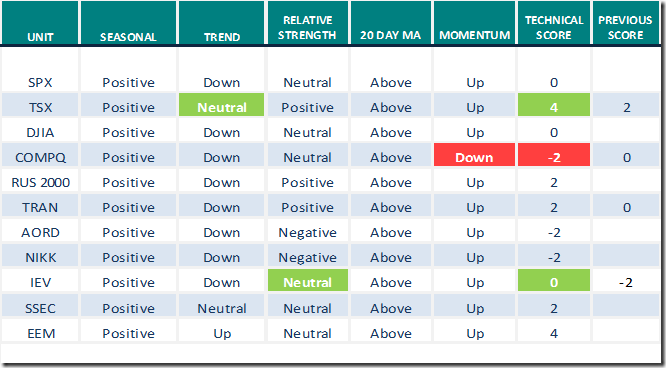 agree about the steroids……I thought the market already knew Powell would have a dovish statement to-day…..guess not….. When you have a moment I would be grateful (and possibly a couple of others) for Armstrong’s private Blog today! Today’s close on the Dow reached the 25,004 and if it holds to close at or above seems we have a Weekly Bullish unless he has a new reading. What is fascinating is that Trump is opening the government until February 15th. 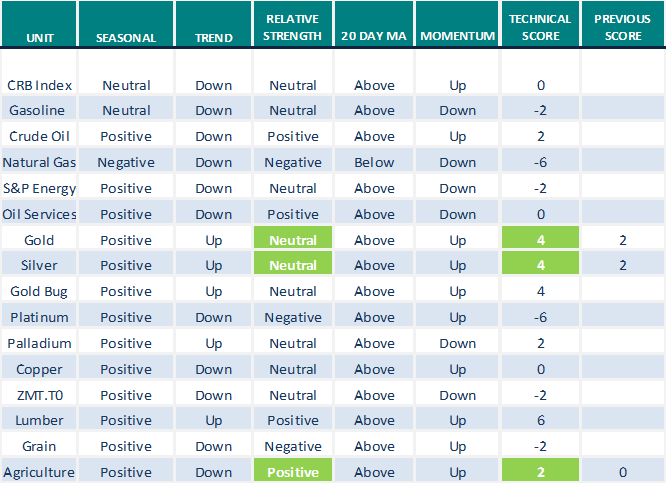 If we look at the Array, in mid-January it was projecting the strongest target would be the week of 02/11. 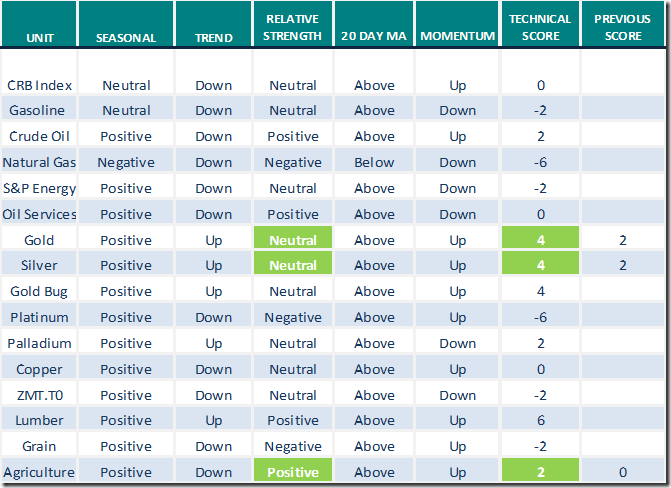 The Minor Weekly Bullish stands at 25004, with the main Weekly Bullish at 25981 zone. 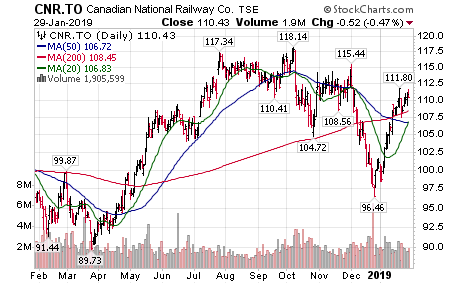 It is this latter level that we would need to exceed on a weekly closing basis to suggest the low is in place. We may have to deal with still testing resistance before the prospect to testing support. The Reversal System is our guide. Otherwise, we do not expect the market to breakout to new highs. 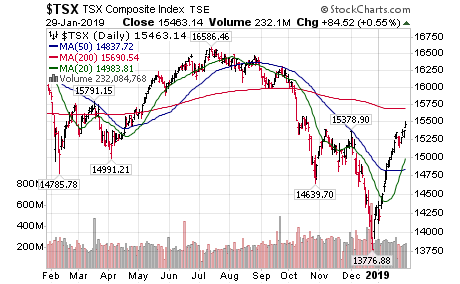 The risk of a new low but holding 21600 remains alive and well unless we start to close above the 25981 level on a weekly basis. This confrontation between the Democrats and Trump is a sad state of affairs for what it shows is that government really comes second and party first. This is a direct reflection of what the model is showing that between here and 2032, we are facing the worse period of a collapse in public confidence. Many already know this is unfolding. They “feel” it in their bones. The collapse unfolds when that feeling spreads to the general public at large. The has been effectively raising rates gradually for the last 10 years. The cheering by the pundits claiming the Fed has yielded to the stock market only demonstrates their inability to ever be an international hedge fund manager for they are obviously clueless. 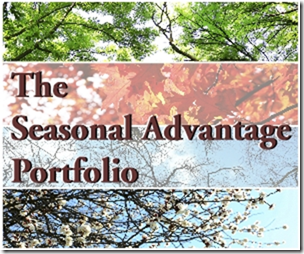 I have explained the trend in detail on the general public blog. However, I do not post reversals of arrays there for obvious reasons. We can see that 2018 was a Directional Change so a pull-back into 2019 was reasonable given this is now the final leg down of the ECM which bottoms in January 2020. Note that 2019 is the turning point and then we have another Directional Change in 2020 with a Panic Cycle in 2021. Volatility will rise from 2021 into 2023. It appears that rates will be rising after 2020 moving into 2023. While this will also be a commodity cycle, that is not the real cause of the rate rise we see on the horizon. 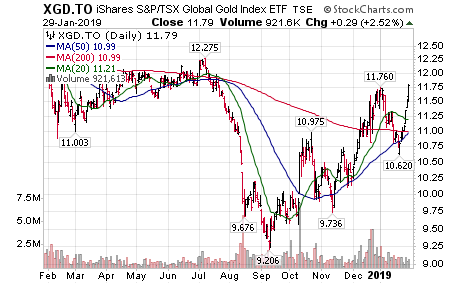 Rates will rise as more and more governments start to become obvious that there is a debt crisis brewing. With the rest of the world imploding, even China, rates will rise as a factor of a decline in public confidence. We still have 2021 showing as the beginning of the Monetary Crisis. There remains the risk of the Euro moving into crisis and this will result in rates rising. The ECM cannot stop Quantitative Easing no matter what they say. 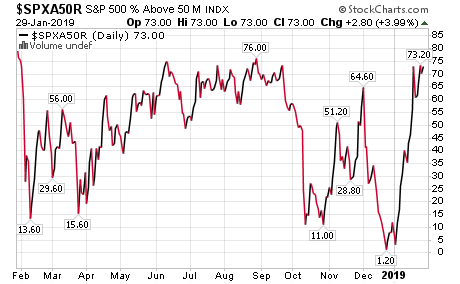 Technically, the resistance stands at 2.67% on the Discount Rate at the Fed. So we have not broken out just yet. 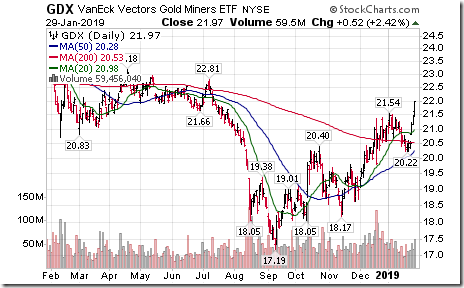 However, we did close above the Yearly Bullish Reversal at 2.25% settling at 2.5%. Therefore, we should fall back to retest support going into 2019 and then the breakout appears to be aligned with the ECM. 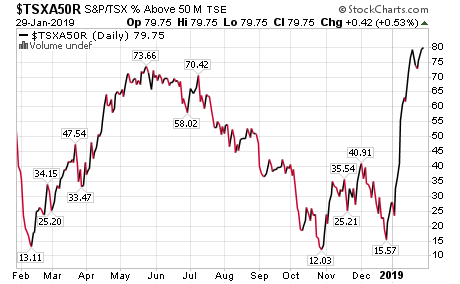 The Canadian dollar does look like it wants to make another Flag. Price would have to basically duplicate what it did in the first 6 trading days of January. That would be typical of a full Flag like this as they do tend to do two of them. We’ll see if that occurs or not. 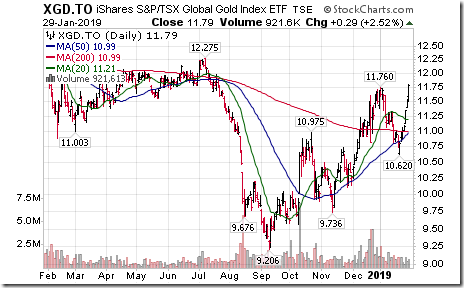 The U.S.$ would need to continue to sell off as well. And it’s not looking too happy. $WTIC has formed a bullish Inverse Head and Shoulder pattern. 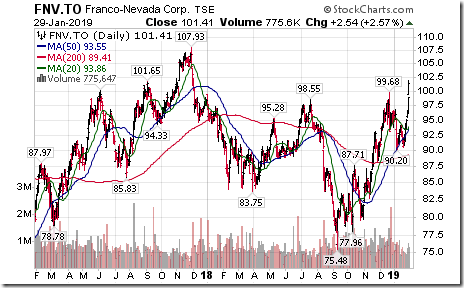 A break above $55 that holds would confirm the pattern and suggest a $10 rally to $65. 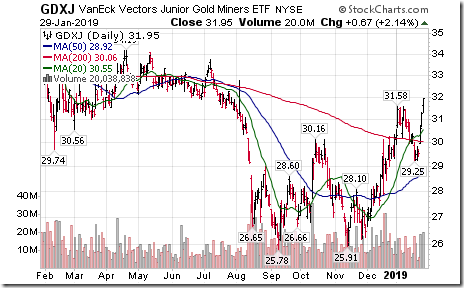 Once again a drop in the U.S.$ would help this and other commodities and currencies to rally. Seeing is believing.